I'm surprised to see three single family houses being built on what looks like a 100' x 100' lot that previously held one. I'm even more surprised to see that each of the three houses has a selling price of $425,000. Is this the future of our city, knock down one and build three??? The former house was a 1950's era house on a 100 x 150 lot. The zoning is for 50 x 100, so the applicant requested a subdivision from the Planning Board for three 50 x 100 lots. There were no variance requests. As for the asking price, I'm shocked at the $425,000. They must be building "junk". 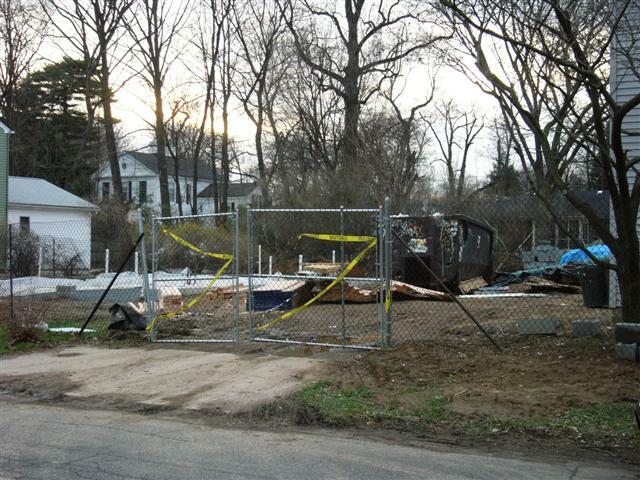 A house was knocked down on Elm Ave near Coles Brook to build two single-family houses on 50 x 100 lots. Those will be going for $525,000. No variances needed there either. More disturbingly, the owner of a burned house on Elm further east got a variance to build one single-family and one two-family home. In my opinion, the board really blew that one. Just because there are already some two-family homes within a block radius does not mean there is a basis for new construction of two-family homes. It may be hard to see from the following pictures, but these homes will be on top of each other when complete. It really upsets me to know about those 3 new homes.There are a few other towns that are allowing the same thing. These new houses are going to take away all the character of the neighborhood, which consists mostly of older homes. One of the nicest things about Hackensack is there are no "cookie-cutter" neighborhoods, but it looks like that is beginning to change! My grandfather, and my two uncles, who were all born and raised in Hackensack, built a lot of the older homes, including the Sears Roebuck house that they lived in on 196 Poplar Ave. It's sad to see builders coming in and buying property and then tearing down the house on it & building new ones that are out of place in our neighborhoods. I think we should have higher standards for zoning and building!